When I first saw the stamps in Taylor’s Christmas SASI sets, I new I wanted to make another Stair Step Fold card… similar to my Halloween one. 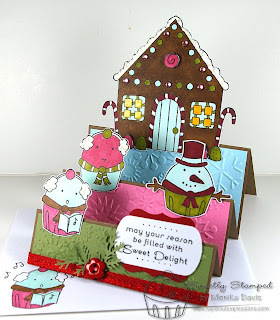 I think these cute cuppies are just perfect for a great winter/holiday scene. What do you think? Directions came from SCS, but I modified the size so it would fit in a regular greeting size envelope. So the base is 10.5” x 4 ¼”… and it was scored at 1.25" - 2.5" - 4.25", 6" and at 8.25". 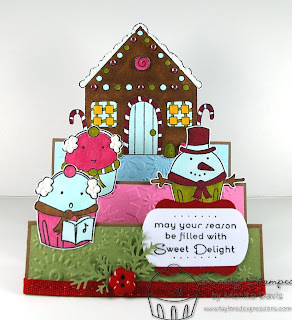 The colored panels are dry embossed with the Snowflake embossing plate. Thanks for looking and enjoy your day! this is just way tooooo adorable! what an amazing job you did! Love it!! You are one creative lady!! I really loved the Halloween one. Could it even be possible for me to love this one more? It's too close to call ~ I love them both! Super sweet and cute! Oh my this is so darling! I sooo need to try one of these! This is too stinkin' cute! Love how you created the whole scene! TFS! This is adorable! What great images to use for this type of card. I love the little scene you created and how you used the cb ef's. great job!